Sometimes, even when we’ve got our goals listed down and we seem pretty sure of what needs to be done next, there may be some pauses greeting us along the way. Maybe we haven’t felt better since catching that flu bug two weeks ago. Maybe we came back home to find it being broken into. Maybe it’s that hurtful word from last night’s argument with a loved one. Maybe it’s just a broken heart. And most of the time, it is indeed our heart that needs the nursing. So much of our productivity, at times, simply goes astray because we’re not at our best inside. There is only so much that an uplifting soul can do, playing a role in our level of productivity. What we need from time to time are simply reminders – a way to regain our spiritual strength – perhaps some words to uplift our spirits. Lift Me Up, so aptly named, began lifting spirits through the convenience of an iPhone app on June 18th, 2012. It goes by the tagline “Soothe your hearts, soothe your eyes.” Lift Me Up provides Qur’anic verses and ahaadeeth (Prophetic sayings), represented through artwork and doodles created by talented artist Juita Jayaram. The artwork is not only gorgeous; they also bring forth a light element of fun. Soothing verses, pretty colours, fun fonts and cute doodles based on Islamic art and architecture – you won’t want to stop swiping through each quote and artwork again and again. And how wonderful it is to have our hearts nursed and spirits uplifted even further through each swipe! The idea of having these lovely artwork to accompany the words of Allah and those of the Prophet is brilliant as it presents us with an alternative way to understand, remember, and be inspired by the beautiful, meaningful verses. It helps a lot especially for some of us who learn better through visualization. 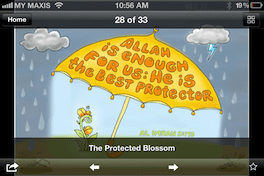 The contents of the app are divided into three categories – Allah is with you, Have faith!, and Patience is a virtue. You have the option of bookmarking your favourite verses for easier reference in the future – perhaps to put back the smile on your face after a hard day. 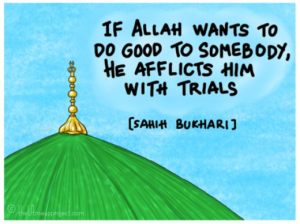 Reading those gave me back faith, assuring me that Allah is always with us, through every difficulty or calamity. 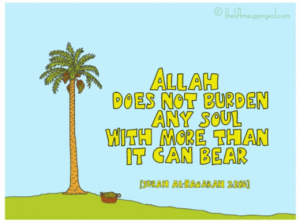 And as mentioned in verse 286 of Surah Al-Baqarah, He does not burden any soul with more than it can bear. Such positivity from the solacing verses and drawings can lift not only our spirits, but also, inevitably, boost our productivity in our daily tasks. Additionally, if you choose to have images from the app as reminders posted in your home or office, some of them are available as prints in A3 size and A4 size. There is of course room for more content and artwork, and my hope is that the app developers continue to add updates to this app. Lift Me Up truly lives up to its name. For more information, head to http://theliftmeupproject.com/.